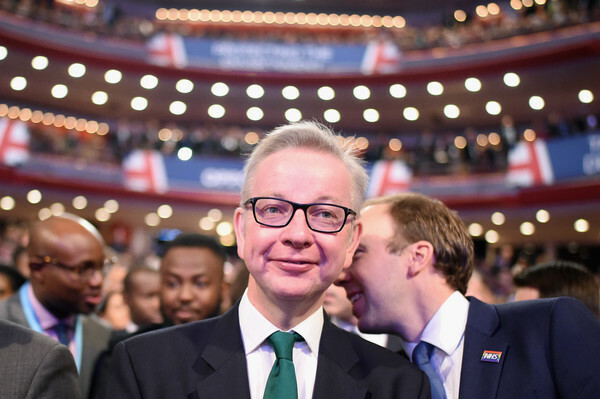 Secretary of State for Environment, Food and Rural Affairs Michael Gove attends British Prime Minister Theresa May's speech on the final day of the Conservative Party Conference at The International Convention Centre on October 3, 2018 in Birmingham, England. British Prime Minister Theresa May will deliver her leader's speech to the 2018 Conservative Party Conference today. Appealing to the "decent, moderate and patriotic", she will state that the Conservative Party is for everyone who is willing to "work hard and do their best". This year's conference took place six months before the UK is due to leave the European Union, with divisions on how Brexit should be implemented apparent throughout.